Across shadow falls & glimmered glimpses of fleeting light. they search for the hidden truths of their aching souls. onwards towards the break of dawn. Together is the most important thing. 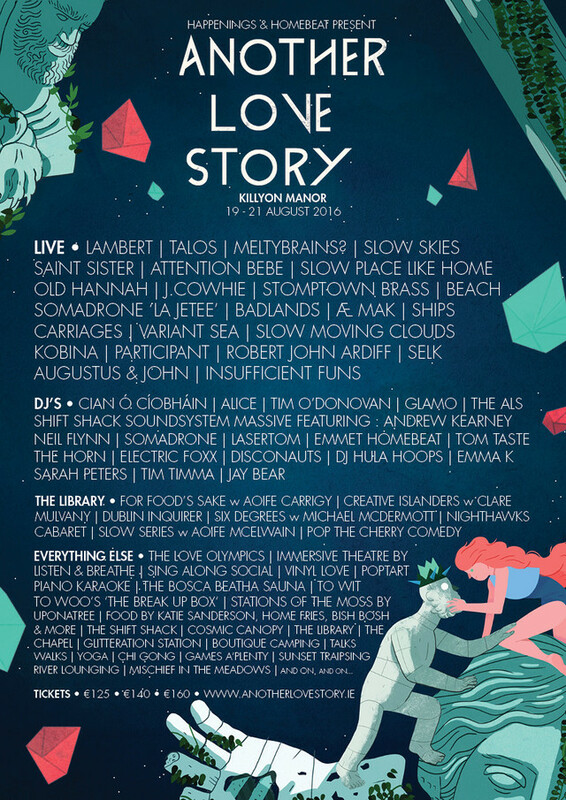 Another Love Story is a bespoke weekender of music, art, whimsy & fun, nestled in the glorious surrounds of Killyon Manor and brought to you by Happenings and our good friends Homebeat. We are delighted to announce the final line-up of the 2016 installment of the annual Another Love Story summer weekender. Another Love Story returns to the stunning wild grounds of Killyon Manor, Kinnegad, Co Meath from Friday 19th August to Sunday 21st August 2016. Now in its third year this hugely successful event will once again provide a blissful alternative to the large-scale festival experience with it’s unique, intimate, hands on approach. ALS are very proud to steadfastly promote the best of Irish talent available, but are also very excited to say we welcome a stellar international act - German piano virtuoso LAMBERT to close out this year’s gathering with a very very special Sunday performance in the beautiful Ballroom of Killyon Manor. Lambert’s recent album ‘The Lost Tapes’ (produced by Nils Frahm) has gained international acclaim for his unique blend of contemporary compositions and unique covers of international artists such as Moderat. Lambert played a sold out show with Homebeat in The Unitarian Church last January. Elsewhere we are honoured to feature the synth pop sweetness of SHIPS, contemporary jazz from INSUFFICIENT FUNS, a very special A/V performance soundtracking French cult movie ‘La Jette’ from SOMADRONE, beautiful folk pop from SLOW SKIES, shimmering electro pop from AUGUSTUS & JOHN, and stunning electro folk from SELK. Returning for another Saturday afternoon of athletic antics - our very own ALS sports day - THE LOVE OLYMPICS, a bespoke, site specific immersive theatre experience by LISTEN & BREATHE, the pop hit of the summer with Aoife McElwain’s SING ALONG SOCIAL, heart bursting, side splitting, shame shedding antics from POP TART PIANO KARAOKE, a Saturday afternoon open air edition of NIALLER 9’s VINYL LOVE, a brand new relationship testing experiment from the darkly romantic minds of TO WIT : TO WOO - THE BREAK UP BOX, natural wanders through neo-natural wonders with STATIONS OF THE MOSS by Uponatree, and we are especially delighted to welcome Shirley’s BOSCA BEATHA mobile sauna for a touch of grounded luxury. ALS 16 will also feature a specially commissioned A/V installation ‘FOR CONOR’ commemorating our late friend Conor Walsh whose recent passing we still keenly feel, the memories of his performances at ALS 13 we cherish, and whose presence we dearly miss. KATIE SANDERSON | HOME FRIES | BISH BOSH | NOMAD COFFEE & More TBA. Experience the incredible luxury of Killyon Manor’s very special Canvas Bell Tents hidden away from the rest of the festival, complete with extravagant comforts such as welcome hampers with chilled prosecco, complimentary massages, ‘hot’ concierge, hot showers & exclusive toilets!